On Wednesday, 4/20/16 (Day 108) I was on my way east passing through rural Indianna and it was time for a break along my way on US Highways. It was mid afternoon and I was coming into Decatur, IN and saw they had a park in town along a river with a 9 hole disc golf course calling me to get out of my Prius and get some exercise. I use this course as an example. It's in a park and although it is a generally open course with few challenges, it provided 45 minutes of needed exercise outside the car. I often play two discs per hole in these 9 hole courses and get twice the exercise. I also use the open course to experiment with new discs and practice my backhand and forehand with each disc. 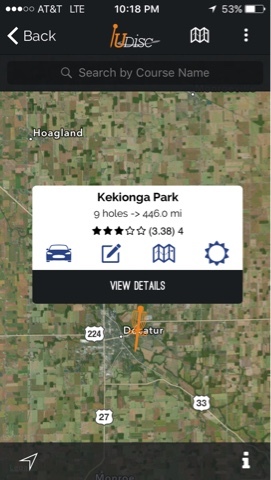 When traveling across the country I just pick a course from my disc golf app and enjoy my game. Although today didn't have anyone else in the course, I do get to meet people from time to time to enjoy someone else's company and learn about life in the local area.